When you’re shooting a subject, what sort of composition are you looking for? Joshua Corbett: This has changed a fair amount for me in the last couple of years. When I first started shooting”seriously,” I think I was pretty instinctual. I shot whatever I thought looked good, whatever reminded me of frames taken by photographers I admired — and I shot a lot — thousands of frames — sort of the “spray and pray” technique. By doing that, however, you don’t have as much time to think and consider your frames as much especially in terms of the story you’re trying to tell and how and why the frames you’re making tell it in the way that you want to tell it. When I participated in the Eddie Adams Workshop last year, two people ended up having a huge impact on my shooting: Cliff Hausner, who works at Profoto, and Colin Crawford, who is a deputy managing editor at the LA Times. After gaining tips from Cliff and Colin, I now try to slow down and think about composition and how it relates to the story more. In addition, I also think about what else I could include in a frame, thinking about the background and foreground in a more deliberate way, moving to position myself relative to subject so that I can build the image. Overall, I look for a clean background for my subject, ways to create contrast, foreground and background layers for depth, and additional secondary elements to create interest, movement, or story nuance. This is a class composed of both blind and sighted students at the Sabeta Primary School. 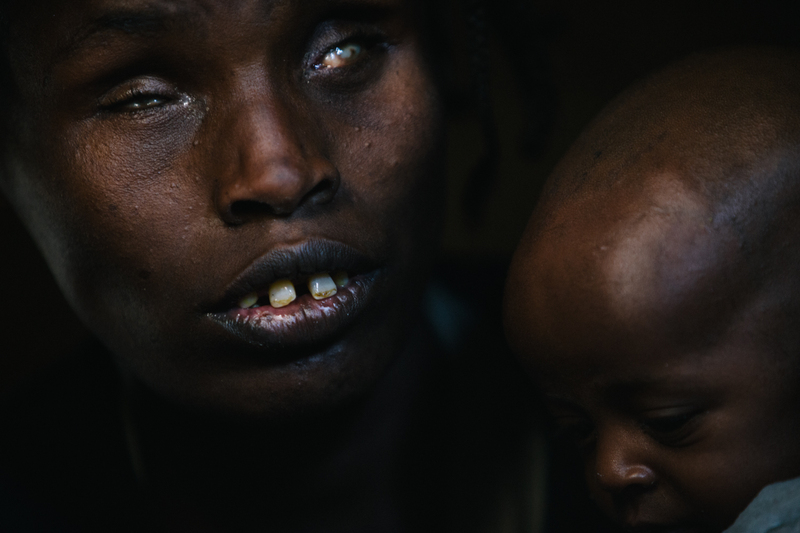 These images from your “Blind Hope” series are powerful, moving, and impactful. They draw out a lot of emotions — empathy, sadness, joy, and hope. How did this project start and how long did you work on it? The opening image is of a young woman, Tesfa (meaning “hope” in the local Amharic language.) She was blind starting at a very young age and cares for her three children. 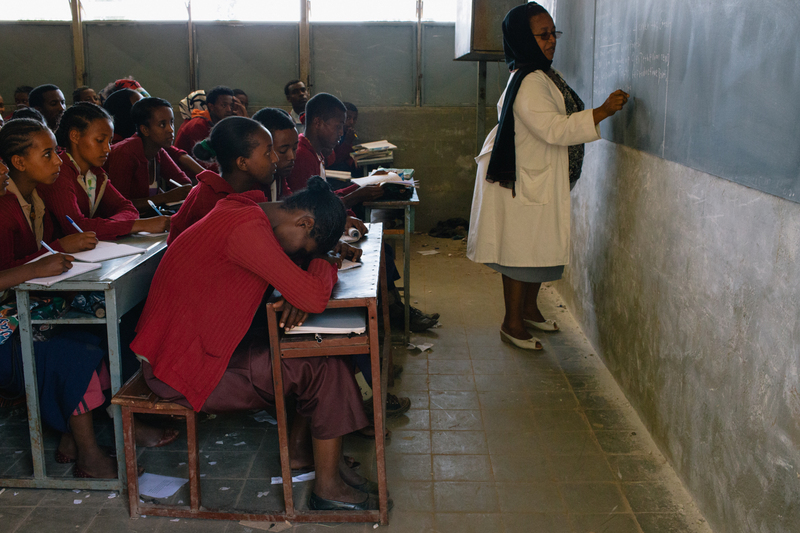 She attends a state-funded residential education program in Sabeta, Ethiopia. I worked on “Blind Hope” over the course of about one month. A very close friend of mine from high school, Kelly, was doing volunteer work in Sabeta, Ethiopia, and I had been wanting to shoot a personal project in Africa for a while. Kelly’s position with an NGO gave her great access to the Sabeta School for the Blind and the blind community in that town. So much of photojournalism is predicated on gaining access, and the access I was able to have was a true gift. I stayed with her on the campus and got to spend a lot of time hanging out with the kids. One of her good friends was a Peace Corps Volunteer at the school and was also very instrumental. He introduced me to Tesfa, the woman in this series and really facilitated the work, especially with some of the older kids. When photographing social issues in the Third World that are compounded by poverty, I think you always run the risk of simplifying complex and nuanced stories. This is a routine challenge when photographing any project and it is something that I try to improve upon in my work. 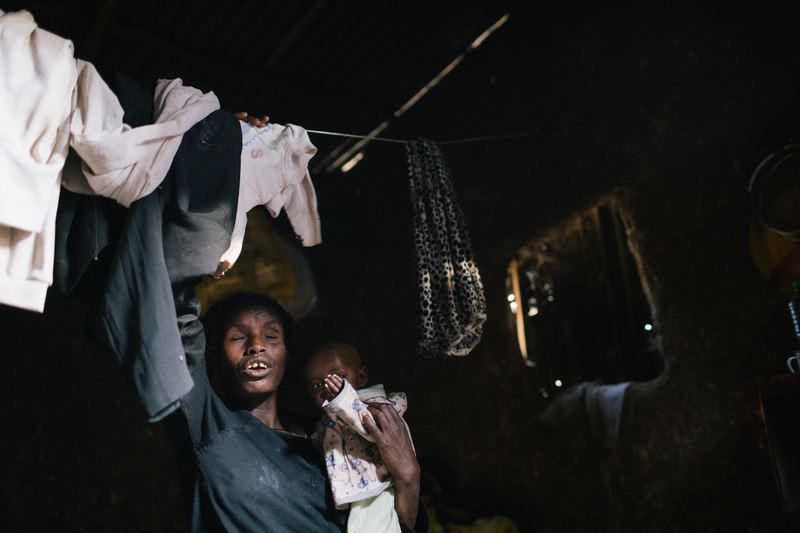 Tesfa reaches for clean clothing as she holds her youngest child. I’m just barely getting started on two personal projects that I hope will come to fruition. My first project will hopefully be about refugees placed in Alaska. I think Alaska is such an odd place for a refugee because it is so different from much of the rest of the United States and harder in some ways. Yet Anchorage is actually an extremely diverse place with lots of small and large diasporas in the community. I want to spend a lot of time with one family in this project as it will be important for my continued growth as a photographer. My second project deals with the subsistence lifestyle in native Alaskan communities and issues related to global warming and endangered species. I am still trying to work out on how to get access to tell that story but I think it will be fascinating one. I first became interested in photography in high school. We had a small dark room and a great teacher. This was back right before the cusp of when digital became high enough quality for professional use. We shot on Tri-X film and developed and printed everything ourselves. I’m glad I had the experience – I don’t know if I’ll ever use an enlarger again. I did not do much with photography for quite a while after high school although I was always vaguely interested. During a year abroad in college, I took a lot of bad photos while traveling around Europe with an early digital point-and-shoot camera. I think it was 3.2 megapixel. I then became interested in photography in a more serious way while I was living in the Philippines as a Peace Corps volunteer. Wanting to document my experience became a big motivation to learn and explore. Photojournalism and documentary work, hands down. I wish I could work exclusively on long term social documentary projects all the time. One of the most enjoyable parts about photography for me is the experiences that you go through to make the photographs. With photojournalism, at least the type that I aspire to, you really have to put yourself out there to experience things that not many people experience and to do it in a very intentional way. You have to meet and get to know your subjects in an intimate and visceral way. It is very uncomfortable a lot of the time, which I absolutely love. It keeps life from feeling like a rut. I also love subcultures. There are so many fascinating people out there, so photojournalism gives me an excuse to poke my nose into the lives of interesting people. I also think documentary work can be very very powerful. It can change people’s views, perspectives, and opinions in ways that can impact lives. That possibility makes it more personal for me — I feel it is a responsibility to do the best job I possibly can. At this point, I feel I have much to learn and so far to go yet. Part 2 of our interview with Joshua Corbett will continue on Thursday.